All right Miles we’ve got some interesting action to talk about today so why don’t you kick us off chair and we definitely want to run through the metals quick because we know that’s why everybody’s here this week. But like Rob said we saw some let’s call it suspect action in the gold market earlier this morning leading into the Fed announcement which we promised you last week we’d cover a non announcement or was it. So we’ll certainly get to that here at the end of this show. 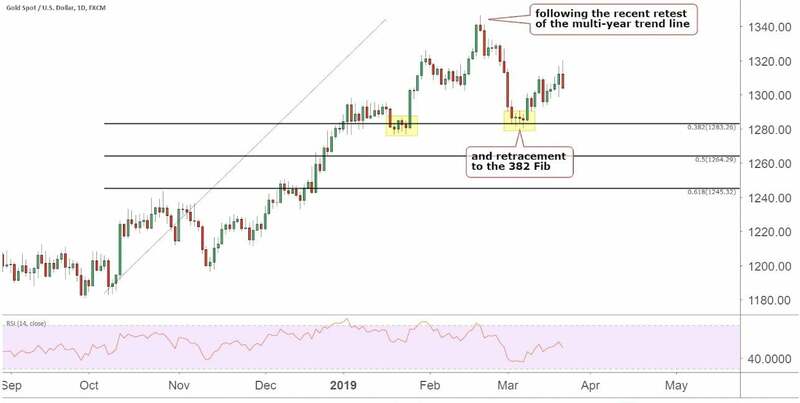 But first as we usually do let’s run through where we think the precious metals charts are going following now retest up at the upper levels back in February around the 13 45 Mark. We did have that sell off down to the 12 85 512 90 range. And Rob you and I have actually been talking about this for the last couple of weeks are we going higher or are we going lower. So we have actually come higher. We came up to that 382 today with the action following the Fed we came up to the 50 percent line which is pushing up to some of the low end of the previous step down levels that we had at the end of February. And we have RSI divergence so are we push in higher. That is a great question. Sentiment is overwhelmingly negative. And I think that’s what some of the suspect action was this morning playing to that sentiment driving it down a billion dollars worth of paper gold hit the market. And we did see a five dollar drop which is all about a billion dollars can buy anymore more trying to push it down. And it looked like it could go lower. Sure in the following action on the dollar when they chose not to do anything with interest rates. And I think looking at the Dow and looking at some of the other markets there was a sentiment that maybe they would consider decreasing rates again as opposed to the history of the last few years so this has certainly had an effect on the gold price today especially and the other metals as well when we get to the dollar we’ll see a nice correlation between the action in gold and the action in the dollar in the other markets like the equities looking quickly at Silver. I pointed out a potential head and shoulders pattern last week that we could be building I could just be seeing faces in the clouds at this point but it’s certainly starting to step up that way again with today’s action. The silver market has pushed up to the 50 percent line on the recent high. So if it continues up we could have a third retest of that previous high that we’ve seen twice already this year. And then we’ll see where the action goes from there. But Silver you know Tori talks about it every week Eric and I know you were in here last week chatting about how the ratios play into this not just here at McAlvany ICSA but ratios in all of these commodities. So where are we looking in the silver markets. What’s the ratio we’re targeting. What are some of the conversations we’re having with coins right now. You know Miles really what we’re looking for in the silver market is for Silver to start outpacing gold and if we can get some some real steam behind the metals market and gold starts to move up as we know silver will outpace that very quickly. Well we’re looking at a slowdown in the transports. And I don’t know if we have a chart for that but the transports are showing us that the economy does appear to be slowing unless the transports can recover. Speaking from the standpoint of being a gold bug like I am I think that gold will continue to be range bound until something can kick it loose or someone decides that it’s going higher. And I think we may have seen that indication this afternoon maybe one day does not make a trend but I believe that the White metals are going to languish for a while yet the only event that I see changing that is either the supply side coming out of South Africa for platinum or the demand side from the automobile manufacturers switching back to platinum catalytic converters for gasoline engines the value of knowing that say after the big crash in the Dow fourth quarter of 2018 and the Dow starts to rebound the transports did about half the percentage up that the Dow did. So we knew that the transports were languishing behind ānanda industrials. Yes exactly. So lo and behold it was very reasonable to assume that the industrials were probably going to turn around and the transports would as well. And they certainly have. So there is that industrial component to the White metals that you don’t necessarily see with gold. And what ends up happening is. In any bull market you’ve got your staging phase and your mania phase and then finally your culmination. Yeah the blow off yeah. Generally when you hit that mania phase that’s when the general public gets involved. You want to already be in by then if you’re not the general public looks around and goes Holy smokes I can’t afford this. What can I afford. Correct and that’s why you know when I remember 2009 2000.